If you were the sole human on a space station full of aliens, you’d probably get a discrete job to avoid standing out. Space sanitation. Maybe Space accounting. Unfortunately for Lilly, the star of IDW’s new series Satellite Falling, her job makes her the most infamous being in her solar system. 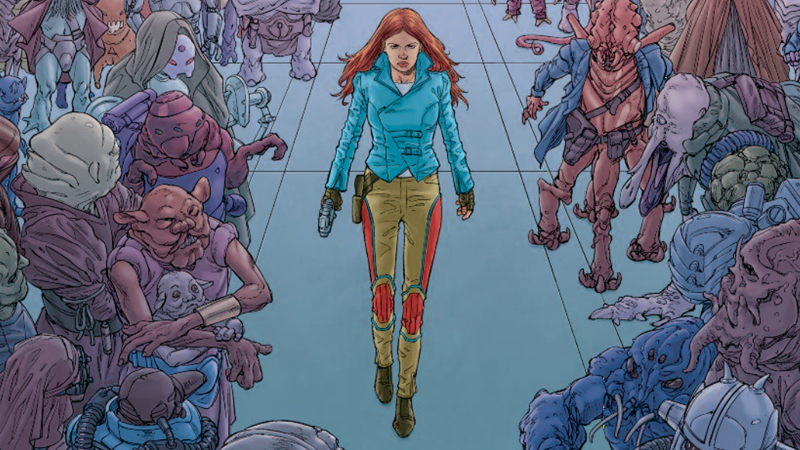 Check out an five-page preview of the first issue, right here on io9! From Steve Horton, Stephen Thompson, Lisa Jackson and Neil Uyetake, Satellite Falling follows Lilly three years after she lost her partner, Eva, and moved from Earth to the titular Satellite. Now, as the only human living on the habitat, she makes her way hunting down bounties on undesirable denizens... at least until the arrival of a mysterious figure on the station threatens to turn Lilly’s life upside-down. Satellite Falling #1 hits shelves this May.